This question comes up often when I discuss the layout and design of a client’s kitchen. The answer is that it depends. The kitchen size will make a difference; If the available space is somewhat small and can’t support both reach ins and a walk-in, then even a small walk-in would yield better cu ft of storage. kitchen with staffers all heading to the one refrigerated walk-in available, or running up and down to the cellar when they need refrigerated ingredients. 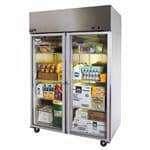 It is a good food safety practice to place a refrigerated unit into each work area. This will make employees become more efficient in their movement, and quicker access will result in faster and better service to your clients waiting in line or sitting at your tables. This will include the strategic placement of refrigerated chef bases right under the counter cooking pieces. These units will have pulled out drawers with the various food pans filled and ready to go onto the grill - range and char-broiler placed just above. Drawers are always a good consideration because they are easily organized and have food ingredients that are able to be accessed with much less bending (employee fatigue and backache hampers output). Salad top refrigeration will also store active food ingredients with efficiency so that ingredients are located right at the food preparer’s fingertips, thereby minimizing unneeded movement and bending. 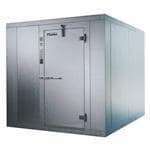 Another important factor is that food safety authorities will also be in favor of separating the unprepared foods stored in the walk-in from the prep’d foods that are stored in the reach-ins, worktops, chef bases, and salad top refrigerators. Indeed, appeasing health inspectors is more than simply ‘passing the test’ - it ensures that you’re doing everything that you can to take responsibility for the safety of your customers! By analyzing your kitchen setup and needs, I can design the perfect layout including all refrigeration units that are appropriate. Give me a call today!